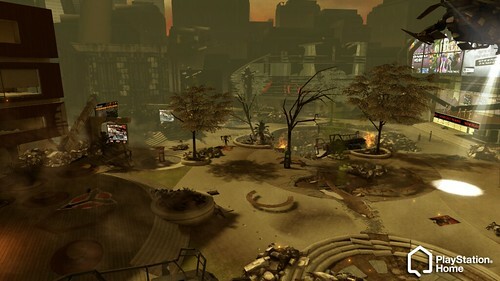 Beginning on Thursday, January 27th, the Central Plaza will be transformed into the last remaining ISA stronghold when Killzone 3 Invades PlayStation Home. Join the remaining members of the ISA as they defend Home against the relentless Helghast assault. The Central Plaza Defender is a first-person shooter that pits you against wave after wave of Helghast forces. Fire at the approaching enemy forces, shooting down Helghast airships, ground vehicles, and infantry units or assist gunners by collecting and delivering ammunition, repair kits, and first aid. Complete challenges to be granted exclusive PlayStation Home rewards. Furthermore, completing all three levels will grant you three Unlock Points, which can be redeemed for new weapons and abilities in Killzone 3 multiplayer. The enemy is well-armed, resilient, and fueled by Visari’s martyrdom. Your success will require both a strong sustained offensive and support from your unit. Be sure to log in to PlayStation Home this Thursday to take play this exclusive game and take advantage of the special Killzone 3 pre-order offer. Too bad I already preordered from Gamestop. You’ll be MORE than shocked once you actually experience it. It’s devastating, exciting and thrilling all at the same time! Amazon doesn’t have release date shipping for the helghast edition! Come on in! We’ve released tons of new games recently and will keep the content updates coming through the Killzone 3 event and after. meh… i dont understand the appeal of home because my friends list is never using it. You can always become a trendsetter while earning exclusive Unlock Points for KZ3 during the invasion. Then you’ll be ahead of your gaming buddies when the game releases! I saw this on IGN a few days ago and I must say, I’m excited. I am surely going to make use of the preorder function through there. Nice job really integrating Home into other PS features guys. Keep up the work and I hope to see more stuff like this in the future. Wow, so if ordered through PS Home, players can receive many of the items included with the Limited Edition. Pretty nifty deal! I will most definitely check this out, 3 unlock points are a nice incentive to see whats new in Home. …and that’s on top of the 3 unlock points you get just for pre-ordering the game from Amazon. We’re talking 6 points total! I think I have a problem with my eyes because Helghast’s eyes always looked orange to me not red XD Just kidding, see you at Home on Thursday! I know I will be HOME ON THURSDAY lol…. Gamestop already has my pre-order for the Helghast Edition, looking forward to checking out the space. Question for Home team, I have a question regarding the Hollywood sweet, I see that it has theaters in it which is cool, will Killzone 3 trailers that stream in Central Plaza will stream there too? Thanks. I’m very glad to see that KZ3 is coming to PS Home in such a big way. I’m trying to encourage as many members of the clan (MAAN) that I belong to to visit Home this Thursday. We have 900+ members and a good portion of them have already pre-ordered KZ3. Then come in and help us protect what’s left of Central Plaza from the invading Helghast! It takes teamwork, and intense skill. And you can get extra Unlock Points for use in KZ3 just by completing the missions, pre-ordered already or not! hell yeah, I’ve gotta get that ISA engineer outfit, that’s probably the best one yet. Be sure to complete all the challenges in the game to unlock the entire suite of KZ3 virtual item rewards. This is, what, the second time in two months that the central plaza has been overrun with invaders from beyond? You’d think they’d install some planetary defenses. I don’t see Japan’s central plaza being turned into a warzone. Maybe we need to borrow some of their Gundams. What can we say? Central Plaza is the hottest place to invade! What if you already have Killzone 3 pre-ordered at Amazon? I don’t want to cancel my collectors edition then end of loosing it. This makes me sad, I like supporting my local gamestop. Give the Jet Pack avatar outfit to pre-orders from amazon too. I already pre-ordered and want it too. Please, please, please… please, please… please… please, please, please, please, pretty please, please… pretty please, please. Sorry, you have to pre-order it from Home to get the jet pack. Ive already pre-ordered through Amazon (had A LOT of credit through their other deals)…do I HAVE to pre-order through Home to get that Home outfit? Hm…I have not pre ordered KZ3 yet. I do mess around in Home and that’s a lot of bonuses for a game I already wanted lol…I think Amazon is the place to grab my copy. Make sure you order it from Amazon *through* Home. Otherwise you will not get the jet pack. The only thing different from the normal Amazon pre-order items is the jetpack for your Home Avatar, if you go to Amazon and look at their list of items you get everything but the jetpack. Forgot to ask how long will the CP be in the degraded condition of War with the Helghast? The assault on Central Plaza is estimated to be a month. It all depends on you! Is Killzone 3 going to have the game launch feature of HOME. I really hope so, It would be pointless to have all this nice stuff going without using the HOME game launch feature. I really don’t understand why 95% of SONY First Studio dont use such feature, and i’m not talking about the way it set up now were you have add random ppl to friend list. I would Hope and love to see that when i pop in killzone 3 and go to PS HOME, that it is actually support by the feature properly. Awesome! every body will be there! See you! I got a question I already had my pre-order set on amazon. So do I got to cancel it and pre-order again to get the costume?? Question though, how secure (especially with everything going on now) is the process of preordering through Home? Good question. It’s completely secure. Upon pre-ordering from amazon, are you given access to the jet pack costume immediately? A voucher code for the jet pack will be emailed to you from Amazon after the game ships. is there going to be a Killzone 3 public game space in Home? Soon? Anytime? 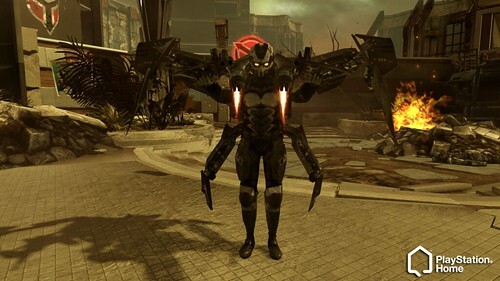 Can you pre-order the Killzone 3 Helghast Edition through PS Home and get the jet-pack outfit and the extra 3 points with it? Wondering about the order through Home and Amazon. Is this Amazon.com only for the US or will it also be Amazon.ca for the Canadian people ordering via Home, as Amazon.com won’t ship to Canada and state to use the Canadian Amazon site ? This promotion is for Amazon.com only. One question, if we pre-order through the Home kiosk will there be options to use Amazon Prime shipping from our Amazon.com account or the $0.99 release date delivery that Amazon has. If I can get my $0.99 release date delivery and order through Home then this is a done deal! Check out the options on Thursday! That’s…kinda messed up, since I’ve already made a pre-order at Gamestop, and you mean to tell us that they won’t give us the code for the jet pack, unless we ONLY order it through Amazon from Home?! That’s like a last minute thing for people who have already pre-ordered it a lot earlier than others! Yes! And we need all your help! Otherwise Home may fall to the Helghast! Bullets will be flying, other units will be flying overhead scouring for survivors, the buildings will be in partial ruin, and only the users are holding them at bay behind the gates—but who knows for how long? do u get the same retro maps from the helghast edition? I wish! We’ll be in Central Plaza (via our US offices). Looks like I’ll actually be in Home this week. If we pre-order Killzone 3 from PlayStation Home will the Kilzone 3 I pre-order have the Socom 4 Beta included? Again Home, you’re denying loyal Killzone fans who do not buy games through Amazon or who have already pre-ordered through another retailer this great opportunity. Why??? The first time you did this was with Killzone 2 when you had the Amazon exclusive ISA and Helghast costumes. I will at least say that those who did not get the opportunity to get those at that time now have the chance thanks to 7-Eleven’s promotion of Killzone 3, though we’ve had to wait for two years. The Central Plaza redesign and rewards for Killzone 3 are awesome though. @38 yes, all early copies will have it, so if you pre-order (regardless of where you pre-order from), you will most definitely have it. wow, I actually have a real reason to use home for the first time in ages! Can we pre-order the Helghast Edition in there? If not I will hit up Best Buy for mine later on this week. See you online Thursday to wipe out some Helghast. It’s a shame we cannot play as the Helghast though. :*( That would be more fun to play. The Plaza looks cool. but, I hope it doesn’t end up like slap happy Sam’s side show stage. The Que gets stuck all the time. I have purchased this game and have only been able to play the one in the Plaza. Any disc game coming out does me no good with multiple broken bluray’s so that pre-order doesn’t really apply to me. Too those without a 7-11 near you:Alphazone4 has five codes you can start with for the Home items that will be available early February. Bring Nascar 2005 to PSN with online play. PLEASE. All of that in HOME!?!?! WoW talking about going to the next level. Must get onto home soon, and pre order kz3, that jetpak is just to wicked cool to ignore. PS: Thanks for bringing DC Universe to the PS3, as a console owner i always wondered what playing an MMO was like, now i am enjoying the excellent DC Universe MMO, what a treat! Quick question on Home, Is there anything in Home that you can use the move with.